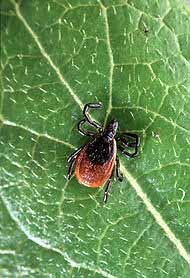 Lyme disease, or Lyme borreliosis, is an emerging infectious disease caused by at least three species of bacteria belonging to the genus Borrelia. Borrelia burgdorferi sensu stricto is the main cause of Lyme disease in the United States, whereas Borrelia afzelii and Borrelia garinii cause most European cases. The disease is named after the town of Lyme, Connecticut, USA, where a number of cases were identified in 1975. Although Allen Steere realized that Lyme disease was a tick-borne disease in 1978, the cause of the disease remained a mystery until 1981, when B. burgdorferi was identified by Willy Burgdorfer. Lyme disease is the most common tick-borne disease in the Northern Hemisphere. Borrelia is transmitted to humans by the bite of infected ticks belonging to certain species of the genus Ixodes (the hard-bodied 'hard ticks'). Early manifestations of infection may include fever, headache, fatigue, depression, and a characteristic skin rash called erythema migrans. Left untreated, late manifestations involving the joints, heart, and nervous system can occur. In most cases, the infection and its symptoms are eliminated with antibiotics, especially if diagnosis and treatment occur early in the course of illness. Late, delayed, or inadequate treatment can lead to late manifestations of Lyme disease which can be disabling and difficult to treat. Some Lyme disease patients who have completed a course of antibiotic treatment continue to have symptoms such as severe fatigue, sleep disturbance, and cognitive difficulties. Some groups have argued that "chronic" Lyme disease is responsible for a range of medically unexplained symptoms beyond the objectively recognized manifestations of late Lyme disease, and that additional, long-term antibiotic treatment is warranted in such cases. Of four randomized controlled trials of long-term ceftriaxone and doxycycline treatment courses in patients with ongoing symptoms, two found no benefit,and two found inconsistent benefits and significant side effects and risks from further antibiotic treatment. Most expert groups including the Infectious Diseases Society of America and the American Academy of Neurology have found that existing scientific evidence does not support a role for Borrelia nor ongoing antibiotic treatment in such cases. Symptoms - Lyme disease can affect multiple body systems, producing a range of potential symptoms. Not all patients with Lyme disease will have all symptoms, and many of the symptoms are not specific to Lyme disease but can occur in other diseases as well. The incubation period from infection to the onset of symptoms is usually 1Ð2 weeks, but can be much shorter (days), or much longer (months to years). Symptoms most often occur from May through September because the nymphal stage of the tick is responsible for most cases. Asymptomatic infection exists but is found in less than 7% of infected individuals in the United States. Asymptomatic infection may be much more common among those infected in Europe.